For the first time in its 30-year history, HSN is selling cars on television. The Home Shopping Network has sold a number of interesting products in its 30-year history. The 24-hour/7 days a week shopping channel has sold everything from Esteban guitars to Wolfgang Puck cookware. And now, thanks to a new partnership with Toyota, the home shopping giant is selling cars. On Sunday, Toyota became the first ever auto manufacturer to appear on HSN in the company’s history. Titled “Discover Toyota,” the program featured the all-new Toyota Avalon Hybrid. Aside from introducing the Avalon Hybrid, the show also highlighted the rest of Toyota’s hybrid lineup including the Camry Hybrid, Highlander Hyrbid and its Prius collection. In order to acclimate viewers with Toyota’s hybrid family, HSN enlisted the help of automotive experts Micah Muzio of KBB.com and Tara Weingarten of Vroomgirls.com. The experts, along with HSN hosts Marlo Smith and Brett Chuckerman gave viewers an inside look at each Toyota hybrid and the technology behind it. It should be noted that Muzio and Weingarten were brought in by Toyota for the program. Additionally, viewers were encouraged to participate in several interactive features on the Toyota/HSN site during Sunday’s airing. The site featured Toyota-related activities including quizzes, videos and a Toyota-themed game. Game participants earned points for playing, which can be used to win numerous prizes, including the chance to win an all-new Toyota Avalon Hybrid. Although the partnership may seem rather strange because it’s the first of its kind, Toyota maintains that it’s all about exposing the brand to a wider audience. “HSN has a really loyal and engaged base of viewers, so it was a natural partner to help us expose our growing lineup of hybrids to people across the country. We got such an enthusiastic response from HSN's viewers and fans, so we'll continue to push the envelope on how we help people discover Toyota,” said Ed Laukes, VP of Marketing Communications and Motorsports at Toyota Motor Sales. Just because HSN’s first broadcast is over doesn’t mean you still can’t participate. Visit the HSN/Toyota site to claim your tickets to enter the Avalon sweepstakes. Visitors can also read KBB.com’s “Top 5 Test Drive Tips” and take the “Which Toyota Vehicle Is Right For You” quiz. Toyota’s hybrid prowess has grown tremendously since it released the Prius in 2000. 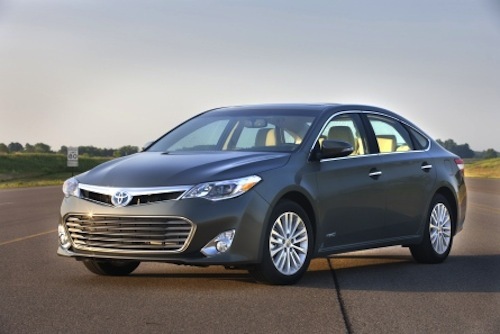 Since then, the automaker has introduced hybrid versions of popular models like the Camry, and now the Avalon. Since 2000, Toyota has sold nearly 75 percent of all hybrids in America. While it may be the first time HSN has ever sold a car on the air, the company has automotive accessories from the start. HSN currently sells many car accessories like car mats, jumper cables, blind-spot mirrors and handheld diagnostic devices.